Up along the banks of the Damariscotta River in Maine there used to be two stadium-sized piles of oyster shells. Where did they come from? Why are they there? What can they tell us about the people that created them? There are mysteries in the middens! A couple of weeks ago, Outside/In went on a field trip up to Damariscotta, Maine. In that town, about 15 miles upstream from where the Damariscotta river flows into the ocean, we met up with Arthur Spiess, Maine’s state archaeologist. We walked along a fairly unremarkable path that led down to the water, threading its way through overgrown apple trees. But there’s something special there, buried under just a few inches of soil. “That’s what’s left,” Spiess says. Close to the edge of the water there’s a little brook running down the hill, and the water has peeled back the layers of earth. Along the bank where you would expect to see just bare, brown, naked earth there was this jagged wall of shockingly white shapes. This shining, opalescent riverbank is actually made up of thousands of oyster shells, piled on top of each other. Arthur has actually dug all the way down into these shells, and found that they are still around six feet deep. And that is just the remnants. “There was an even larger pile of shells that went from the river, back to where those pine trees are… about a hundred yards, yeah. And it was 15 to 18 feet deep at the deepest.” Spiess explained. When you do the math, this comes out to more than 300 dump truck loads of shells. And some of these were monstrous oysters: 15-18 inches long with meat inside the size of your palm. There were actually two of these massive oyster shell piles in this spot: one on either side of the river. The spot where we stood was called the Whaleback Midden, and is now gone. It was mined for chicken feed in 1886. On the other side of the river is the Glidden Midden, which is still intact and continues to be one of the largest shell heaps in the country. So, what gives? Where did they all come from? The short answer is that indigenous people left these oyster shells in this spot after taking them from the river, opening them up and eating the meat inside. Radiocarbon dating of shells at the very bottom of the pile show they were left there about 2,000 or 2,200 years ago, and judging from the types of pottery fragments that Art has found in the pile (and the absence of metal tools or other European goods) he thinks the pile stopped growing around 600 or 800 years before the colonial Europeans arrived. But who were the people pitching the oyster shells? Chris Sockalexis, the tribal historian of the Penobscot Nation and an archaeologist, thinks they were probably the ancestors of his people. The Penobscot are one of five tribes in Maine that collectively referred to themselves as Wabanaki, or ‘Easterners,’ and he thinks the people in this spot likely spoke a language very similar to their modern languages. But getting specific about how they lived is very difficult, since their tradition was passed down orally, and most of their stuff was made from biodegradable materials. And what’s more, indigenous people in this region lived in smaller groups with pronounced differences in their lifestyles. Some lived on the seacoast year-round, some were moving up and down river depending on the season, and each had their own rhythms that helped them find food year round. “You would have to say there are similarities coming from hunter-gatherer groups, but as they split off into kinship groups, each family would have their own certain mini customs and rituals, but when the larger aggregation comes together, they share that common bond,” says Chris. This is part of what makes these big piles of shells on the Damariscotta so amazing. Most shell middens are much smaller piles, maybe five feet deep and tens of feet across. But these are an anomaly. They’re so big, many people reason that they couldn’t possibly have come from one group: it had to have been many groups of people, over many years. But you all are the curious sort, and I can tell you want more than that. You’re hoping for a better explanation, but all we’ve got is shells. How do you answer these questions with nothing but shells? “Not a lot,” he concludes. While this might not sound like much to reconstruct what life was like for the people who ate all of these oysters, it’s a heck of a lot more than you’ve got in a lot of other places. 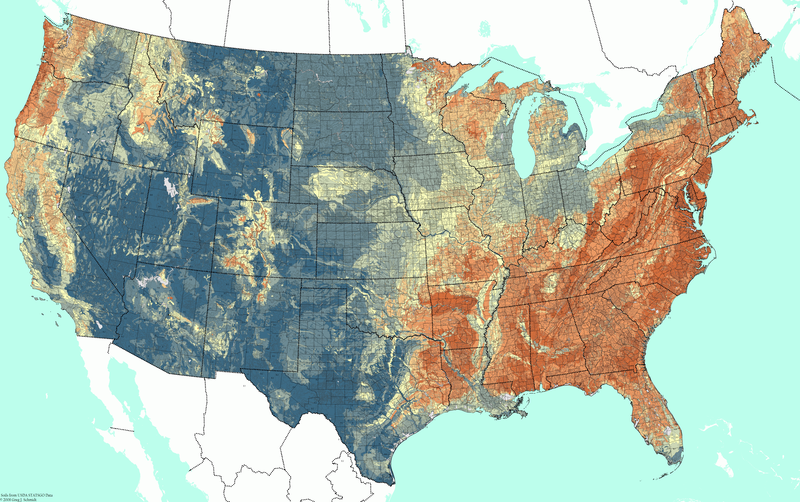 In huge chunks of the world—the Eastern US, Europe, Russia, Central America, Northern South America, Southeast Asia and Central Africa—the soil is actually slightly acidic. Meaning that over hundreds of years, the soil itself dissolves any human or animal bones buried in it. Map showing the acidity of soil, orange being acidic, blue being basic. Courtesy of: Kartesz, J.T. The Biota of North America Program (©BONAP). 2015. North American Plant Atlas. Chapel Hill, N.C. But if you cast yourself back to high school biology, you’ll recall that shells contain calcium, and calcium is basic; the opposite of acid. “The shells neutralize the soil acid, make the soil sweeter. Raise the pH above 7, and bone is preserved. And we love these sites for that reason,” explains Bruce Bourque, the recently retired head of archaeology at the Maine State Museum. So just from the beginning, what little we can know about the past here, we know thanks to the shells. And actually, just from some bones and shells, we know more than you might think. For one, the piles are full of fire-rings, which are full of fish bones. “The fish bones that are in here are mostly alewives, and they come up here in the spring,” says Spiess. There are also scattered animal remains, including the jawbones of deer, the teeth of which can also tell biologists when they were killed. Similarly, oyster shells grow in predictable annual patterns that can be seen using a diamond saw and a microscope. Spiess says both the deer and the oysters were eaten in the late winter or early spring. These remnant imply that people would gather by the banks of this river, right around the time of year that the alewives would return from the ocean and swim upstream to lay their eggs. This time of year is often known as the hungry time: as winter slogs towards its finish any food you managed to save up during the summer and fall is long gone and no new edible plants are starting to come up yet. Just the time of year when it would be really great to be able to go to a place where you can find oysters the size of your fist just sitting on the bottom of a river. The people who were doing this came from hundreds of miles away, if not more. We know that thanks to the stone tools and projectiles. “Some of these stones traveled long-distances, primarily from the Moosehead lake area and Munsungan area, but we also are finding evidence in shell middens that the stone to make the tools is coming from as far away as Pennsylvania, possibly Ohio, [and] Labrador” says Sockalexis. And so the middens grew, a few shells at a time. Each year the people who came added about a half a dump-truck to the top of the pile. And every year, when the people came back and set up camp, sometimes they would move in right on top of shells from years ago. All through the heap of shells, there are black stripes of soil and charcoal showing where people set up camp on top of the shells. Generation after generation, one on top of the next. That, as near as we figure, is where these piles came from. Why Did the Pile Stop Growing? As far as we know, the people who made these massive, impressive piles of shells, stopped adding anything to them before Europeans arrived in the Americas. So what happened? To understand the most common explanation, you have to remember that the world didn’t always look the way it looks now. “If you want to find the coastal campsites of people who were here 10,000 years ago you have to go offshore… and you’re in about 150 to 200 feet of water,” says Spiess, noting that indigenous artifacts are often found in the dredges of scallop fishermen. The oceans have been slowly rising ever since the last ice age. When the ocean was farther away, the tides didn’t use to reach all the way up stream. And just downstream of these two piles of oyster shells, the river runs over a strip of rocks. So we can imagine that at first those rocks were a waterfall. But then as the water rose, this river began to swell, and the bottom of that little waterfall got higher and higher until, during high tide, the waterfall actually started to flow backwards. Then during low-tide, the water would drop, and it would reverse again. Those rocks became a two-way waterfall. Now, a couple of rocks and rapids wouldn’t have stopped tiny oyster larvae, which drift with the currents, but they might have kept out their main predators, a snail called the oyster drill. So this little barrier could have been what allowed for a massive oyster reef to form—one big enough to draw bands of people every spring from hundreds of miles around, walking or paddling in canoes, to eat oysters. But the same effect that created the reef, may have led to its demise. As the centuries passed and the seas continued to rebound, eventually that two-way waterfall would have begun to flood out, and bit by bit, the oyster drill snails could have begun to slither their way through. Over many years that massive reef would have begun to shrink. “With the declining oysters, you kind of have to think, why would you go back?” asks Sockalexis. This, he argues, explains we don’t see any artifacts in the pile that would have come from colonial Europeans. But for some of the people who have studied this place, there are things that don’t quite add up. Now, not a ton of people have studied these particular shell middens, but one of them is Deb Wilson, who was an archaeologist for around 20 years. Deb reviewed the artifacts that had been saved from the Whaleback Midden when it was mined and started to notice some odd patterns. For one, there were a lot of bear scapulas—shoulder blades—in the animal bones in the pile. In some tribes, scapulas were and are used in this thing called Scapulimancy. “You know they’re flat, so they would heat them on a fire and interpret the way they crack. As they might be wanting to decide where to go hunting. And they would find paths, in the cracks in the scapula,” says Wilson. The mound builders cremated and buried their dead under elaborate piles of earth. So Deb thinks that maybe there’s something else going on here. Like maybe some folks from the mound-building culture made their home here at some point, and in just a few generations, built and deliberately sculpted these massive shell piles. When colonials arrived, they called the bigger of the two middens the Whaleback, because it looked like the profile of a massive whale. Deb thinks maybe that was intentional. To her, this place feels like it could have been a monument, of some sort. But Bruce Bourque has his own—perhaps unprovable—favorite alternative theory. Remember the nice tidy little story, about the rapids, the big reef, and the snail drill? There’s just one problem, with it. “It’s never been proven,” says Bourque. it’s just an idea that was published in a paper many years ago, and no one’s disproved it, but it’s plausible but unproven. His preferred hypothesis is that the indigenous people were adding to the pile all the way up through contact with the colonial Europeans and in reality it was shipyards, built up stream dumping sawdust into the river that put an end to oysters in this spot. He thinks the reason there have never been colonial artifacts found in the piles is white settlers had already disturbed the middens before they could ever be investigated. He thinks they took shells from the tops of the piles and burned them to make lyme for bricks. This is what happens when you’re looking for clues in a two-thousand-year-old pile of oyster shells. To some archaeologists, this big pile of shells is just a big pile of trash that built up slowly and unintentionally. To others this pile could be something symbolic, or sacred. This is the fog of time, which just lets us see hints of shapes. Fuzzy outlines of something that might tell an appealing story. Deb Wilson thinks we’ll never know the answers to some of the most fundamental questions about what happened here. It took the chicken feed mining operation only about a year to completely excavate the Whaleback Midden, which took more than a thousand years to amass. It was during this mining operation that the colonials, without anyone’s permission, unearthed human remains of the native people who created this pile. Fortunately—and uncharacteristically for the time—an archaeologist was hired to keep track of artifacts and human remains that were found in the pile, or we would know even less about this place. One of the biggest piles in the country, one of the most remarkable monuments to indigenous peoples’ heritage is washing away. This is a story not just along the Damariscotta river. There are thousands of shell middens in Maine alone, and by their very nature they are close to the coast, and are at risk from rising seas. So when they disappear, the fog of time gets thicker, more impenetrable. For the descendants of the people who lived in this place, it’s tough to know how to feel about this. Outside/In was produced this week by Sam Evans-Brown, with help from, Maureen McMurray, Taylor Quimby, Logan Shannon, Molly Donahue, and Jimmy Gutierrez. Special thanks to Peter Noyes and Jesse Ferriera of the Damariscotta River Association, that’s the land trust that owns and maintains the Glidden and Whaleback Midden sites, and to the Peabody Museum of Archaeology and Ethnology at Harvard University, for letting us use their photos of the mining operation at the Whaleback site. And thanks also to professor Joe Hall of Bates College. Just as a matter of pure coincidence, the Peabody will be putting some of the artifacts from Whaleback on display starting Saturday June 3rd, if you’re interested in seeing them. This week’s episode includes tracks from: Sometimes Why, Velella Velella, Podington Bear, Blue Dot Sessions and Ari de Niro. Check out the Free Music Archive for more tracks from these artists. I finally went to visit the rocky peninsula the Maine coast in August of 2015. I had been following what was going on there intermittently by reading the dispatches from the Portland Press herald’s excellent energy reporter (who has an equally excellent byline) Tux Turkel, and occasionally wading into the arcana of the filings at the Maine Public Utilities Commission. But after so much reading, I wanted to hear about it first-hand. If you want to hear the details of the Boothbay project and explanation for why it matters and how it works, you should scroll back up and listen to this week’s podcast. But here’s the tantalizing question that drew me up to Maine: what if everything you thought you knew about energy was exactly backwards? What if the way that we currently do electricity is actually the most expensive option, and all of that fancy “clean-tech” and “green-tech” actually the cheapest option? Certainly, if all you’ve ever done is looked at a chart of the cost per megawatt hour of a given source of energy, this is a surprise. This counter-intuitive possibility is not news to folks who have been paying attention. The Rocky Mountain Institute has been churning out reports saying so for years. For instance, a recent one concludes that technology available today “can unlock $13 billion per year of avoided grid investment and 10 to 40% savings on customer bills.” Another predicts that within 10 or 15 years it will be cheaper to build a new house with solar panels and a battery than to connect that house to the electric grid. But the challenges of rolling out technologies like these are pretty profound. In part of our interview that didn’t make it into the podcast, Richard Silkman, whose company was responsible for the Boothbay experiment, explained to me that he initially had hoped to create a business that would compete with the utilities whenever an upgrade to the grid was deemed necessary. Here's how it would work, the utilities could propose a new power line and wherever the technology was the right fit,his company would propose a competing suite of renewable energy, energy storage, and other technologies that could shift demand away from hours of peak stress on the grid. “But as we got more involved in the process and began to learn more about how the system would treat us, we realized that was not going to be an option,” he said. The essential struggle is that the utility industry is not governed by the same market forces that made massive technological change in areas like computers and other gadgets possible. Utilities have operated for years as regulated monopolies. Only in a few states has something that vaguely resembles a free-market for electricity emerged. In order to make money selling electricity or building power lines, your company must work through a complicated web of regulators, electric rate designs, and separate regional markets for energy, generation capacity, voltage regulation… and so on. Indeed, even as we were putting the final touches on the podcast, a new chapter in the saga had begun. In a filing, the local utility argued that electric demand in Boothbay has been growing more slowly than originally forecast and therefore the pilot project was unnecessary and should be discontinued. It also says that of 13 times they called on the batteries or backup generator, only 6 times did they feed energy back into the grid without any problems. Silkman’s company (in a surprisingly colorful rebuttal, as regulatory filings go) contends the utility “got it wrong,” and that it was in fact the presence of the project which has resulted in declining electricity demand. It also claims that the utility has withheld crucial data it needs to make the pilot work most efficiently, and the only data that has been provided was in a “in an apparently hostile attempt… to discredit the usefulness and value” of the pilot project. In short, if the transition renewable energy and the smart grid is going happen, it’s going to require a whole-sale change in the business model of electricity, and that could be an ugly fight between the companies that deliver us electricity now, and those that may do so in the future. Will that result be something like the Boothbay pilot, or something else entirely? We’ll just have to wait and see. We reported this story back in 2015. There have been a couple of changes which we mention in the version you see below: Episode 39: Champagne on the Rocks. Both versions of this episode are included in this post for the sake of keeping our archival ducks in a row. Enjoy! In the summer of 2015, Scott Jurek set a new record for running the 2,181 miles of the Appalachian Trail. But on his triumphant day atop the last mountain in Northern Maine, his 21st century campaign for the trail's record ran afoul of a park founded on ideas about wilderness from a decidedly earlier time.